CHICAGO, IL--(Marketwire - Aug 2, 2012) - The Jellyvision Lab, creator of the Web Health Awards-winning ALEX™ virtual employee benefits counselor, today announced that Ministry Health Care, one of the leading health care providers in the Midwest, selected ALEX to explain the health system's employee benefits, including a new health savings account (HSA), to more than 6,100 eligible workers. As outlined within Jellyvision's Ministry Health Care case study, ALEX helped boost enrollment for the new health savings account to twice the projected rate. "ALEX represents something very, very useful for us," explained Kerry Brunner, System Director, Benefits for Ministry Health Care. "We are a 24/7/365 operation. For us to try and get out to every facility -- to sit down with everybody and go through their benefits individually -- is frankly just impossible. With ALEX, our employees were able to get somebody talking to them in terms they understood about what affects them personally." Recognized as one of the country's best digital health resources, ALEX received a Silver Web Health Award in the Interactive Content/Rich Media category of the 14th annual Web Health Awards hosted by The Health Information Resource Center. It was the only benefits communication or decision support tool to be so honored. 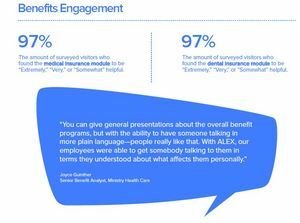 "It looks like the Web Health Awards picked ALEX as the best of breed for making benefits communication more engaging," said Harry Gottlieb, founder of the Jellyvision Lab. "We're thrilled. Even though our kids have no idea what we do for work, now we can at least bring home a trophy." The Health Information Resource Center (HIRC), organizer of the Web Health Awards, is a national information clearinghouse for professionals who work in consumer health fields. Other well-known HIRC programs include the annual National Health Information Awards (healthawards.com), which annually recognizes the nation's best consumer health information (in non-digital formats), and two national "Fitness Day" events: the annual National Women's Health & Fitness Day held annually the last Wednesday in September, and the annual Family Health & Fitness Day USA® held the last Saturday in September. Visit http://www.fitnessday.com for details on these events, both the largest health promotion events of their kind. ALEX was developed by The Jellyvision Lab, a company perhaps best known for developing computer games like YOU DON'T KNOW JACK. Using their proprietary interactive communication platform, Jellyvision offers enterprises a cloud-based, virtual benefits counselor that is accessible to employees anytime, anywhere. To learn more about ALEX, please visit meetalex.com.